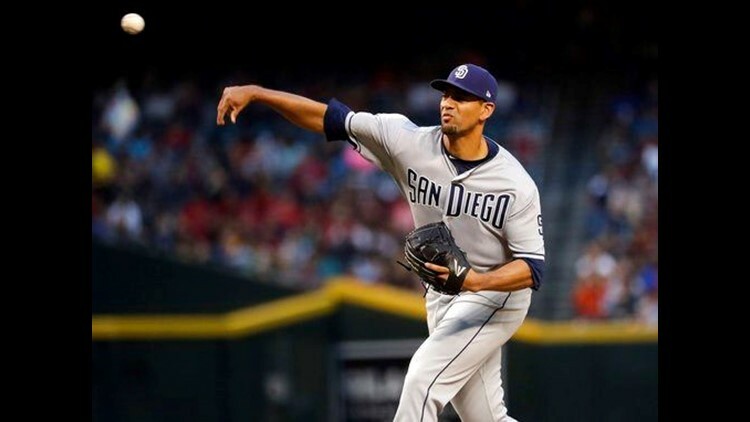 PHOENIX (AP) — Tyson Ross lost his bid to pitch the first no-hitter in San Diego Padres' history when center fielder Franchy Cordero appeared to misplay a ball with two outs in the eighth inning Friday night of a 4-1 win over the Arizona Diamondbacks. Ross had a 1-0 lead with two outs in the eighth when Christian Walker lined a drive to deep center. Cordero seemed to get a late break on the ball, then had it sail just over his outstretched glove for a double that made it 1-all. Ross briefly grimaced, and was pulled after throwing a career-high 127 pitches. In 1972, Steve Arlin of the Padres pitched 8 2/3 innings before giving up a hit against Philadelphia. In 2006, Chris Young threw 8 1/3 hitless innings against Pittsburgh. In 2011, five San Diego pitchers combined for 8 2-3 hitless innings against the Dodgers. Brad Hand (1-2) relieved Ross and got the last four outs — they combined on the 29th one-hitter in Padres' history. According to Statcast, Cordero's home run was the 10th-longest in MLB since 2015 and the longest by the Padres since Statcast was introduced that year. It traveled 116.3 mph off the bat.